LiquaCel Protein from HealthyKin.com is a superb tasting liquid protein that contains 16 grams protein and 2.5 grams of added arginine per ounce. Two factors considered when developing this product were the absolute importance of ﬂavor and texture acceptance. Purified Water, Hydrolyzed Collagen Protein, L-Arginine, Tartaric Acid, Malic Acid, Natural Flavors, Sucralose, Neotame, Potassium and Sodium Benzoate (Preservatives), FD&C Red 40 and Blue 1, Sucralose, Neotame. Please note: Ingredients may vary between flavors. The Percent Daily Values are based on a 2,000 calorie diet. I first had this product at dialysis. As a vegan, I do not drink the other dairy-based products they have. I enjoyed the grape and now the peach mango. I use this product at home on my "off" days. I love it. Other patients at the clinic are now requesting this product, too, even though they don't avoid dairy in general. The product is delicious and helps with the protein we need. Thank you so much for providing this Global Health product and being so efficient at getting into my hands on a timely basis. Love this product. Delivery was next day. I have always had successs with Healthy Kin and the Liquacel but the last shipment, one of the bottles seemed to have a leak and the sticky grape solution had leaked from somewhere but the seal was on?? The seal was soggy. I know the consistency had changed and has more calories and glycerin making it stickier so now I have to stir it to make sure it is dissolved. I will still purchase because has great results. I ordered Peach/Mango and Watermelon. Love the taste of both. Healthykin sent the product immediately and it was at my doorstep within four days. They are a great company to do business with. It's hard to find something my husband will take but he loves this product. I was so happy to see Healthy Kin add LiquiCel's newest watermelon flavor to its offerings. It's been my favorite flavor since my dialysis clinic first began to offer it about 6 months or so ago. 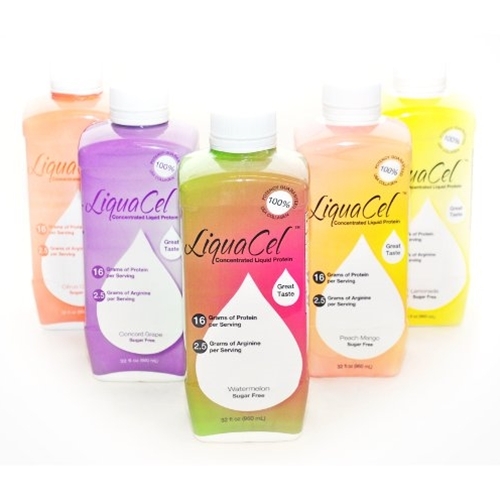 I use LiquiCel's products on my off dialysis days at home. Thank you Healthy Kin for picking this flavor up for us. Lots of us like watermelon there. I'll let our dietician know about Healthy Kin. The shipping, as always, was very timely and came in good order!Yummy! Outstanding service! Healthy Kin has been great to do business with; and very quick delivery! Thank you.